A Denver-based flat-fee brokerage that’s publishing the offer of compensation to buyer’s agents that sellers make through the multiple listing service has been ordered by the local MLS, REcolorado, to stop making that information public. Publishing the offer of compensation to buyer’s agents — which is typically half of the 5 to 7 percent total commission charged by listing brokers in many markets — also lets Trelora inform homebuyers exactly how much they will save if they let Trelora represent them. Screenshot from search.trelora.com listing detail page. The 2.5 percent commission offered to the buyer’s agent on a five-bedroom home in Golden, Colorado, listed for $500,000, for example, would total $12,500. 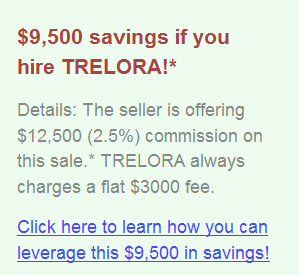 “Click here to learn how you can leverage this $9,500 in savings!” Trelora says in displaying information about the listing on the company’s website, search.trelora.com. Trelora also represents sellers, charging them a flat fee of $2,100, and advising them to make an offer of compensation of $3,000 to buyer’s agents. The company says its nine agents sold 464 homes last year, with 65 percent of its seller clients paying a flat fee of $3,000 to a buyer’s agent. Trelora says 95 percent of sellers in the Denver market offer 2.8 percent or more of their home’s sale price to a buyer’s agent. MLSs require that listing brokers make an offer of compensation on behalf of a seller to any member of the MLS that can bring a buyer to a sale. The offer of compensation is information that’s not typically available to consumers online. Agents and brokers see the offer when they log in to their MLS system, but the offer of compensation is not included in Internet data exchange (IDX) listing feeds, data that’s pooled by brokers for publication on each others’ websites. REcolorado alleges that Trelora is breaking IDX rules that prohibit manipulating listing content in a way that “produces a deceptive or misleading result” and by making parts of the MLS database available to people who are “not authorized” to see it by MLS rules and regulations. Trelora CEO Joshua Hunt said displaying the offer of compensation does not violate rules governing display of IDX listings because Trelora doesn’t obtain the information through an IDX feed. REcolorado’s letter explicitly acknowledges that co-op compensation isn’t part of IDX content, but maintains Trelora has violated IDX rules. Editor’s note: This story has been updated to correct that Trelora charges sellers a flat fee of $2,100.